Chilie is a children’s game. I am not a children, nor do I consider myself as one. That being said, this review is not from, nor intended to be taken from the point of view of its intended audience. So here I sit, frantically clicking random numbers on the screen, performing mental math that elementary school would never have subjected me to, listening to the same bass line over and over again. Someone tell me, please, how am I supposed to get from 1 to 2,550 starting at 1 with +/-1, x2, ½, ⅓, -19, -45, and another ½ at my disposal within 20 turns. I’m not saying it’s impossible, though I’m starting to believe it is, I’m just saying that at this point in time I can’t be bothered to do more math. This is the state I find myself in after playing Chilie for what I feel is too long, asking myself the age old question: How did I get here? Chilie is developer Beckoning Cat’s latest (and only?) title that attempts to combine educational math elements with more casual gameplay features like quick-time events and point and click devices. Its premise? 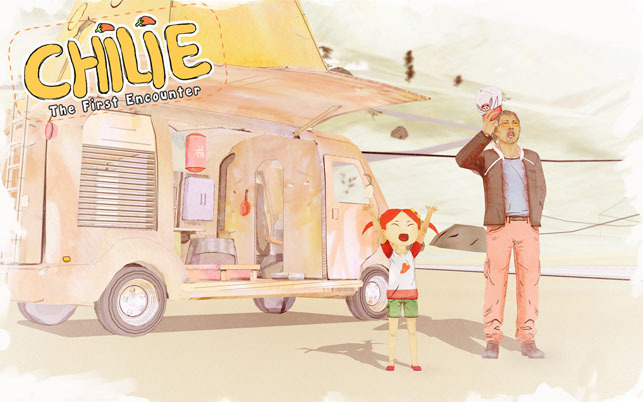 A young, energetic girl, Chilie, travels through China, searching for the whereabouts of her mother with the help of her guardian. During this adventure, she meets various characters and eats plenty of peppers, all while solving math equations that randomly show up. Progression occurs through interactive cutscenes that feature both a series of quicktime events requiring specific arrow keys to be pressed and math equations waiting to be solved. Quicktime events are fairly straightforward with some added rules later on in the game, like a red background meaning to press the opposite button (i.e. up arrow with red background = down arrow), or a small group of arrows meaning to rapidly press the same direction. Most all of these have a finite timer represented via a decreasing loading bar that moves at various speeds, depending on the number of keys needed to be pressed. 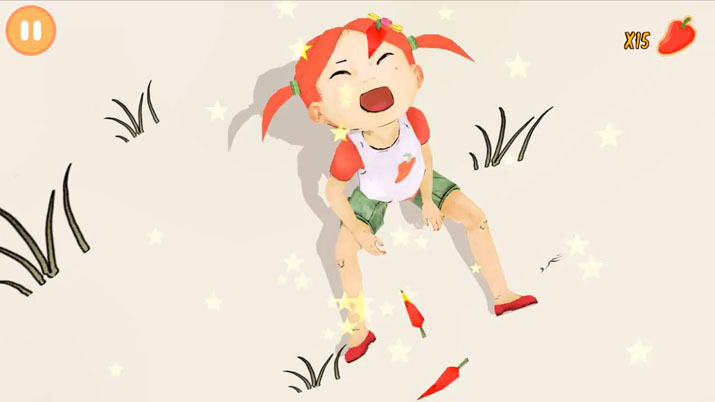 Any failure to complete the sequence before the timer runs out results in a game over screen where you’re given the choice to start over or spend pepper(s) to continue (peppers are awarded for finishing a scene with three stars and randomly appear while playing the game). Math equations are the prominent feature of Chilie, making up the bulk of “gameplay” here. Like the problem mentioned at the outset, the player is given a starting point and an answer to reach, along with multiple integers with various operations accompanying them. Most equations start the player with four ways to interact with their original integer: +1, -1, x2,÷2. Additional addends, subtrahends, multiplicands, and divisors can be found throughout the cutscenes and during still frames to “help” solve the problem quicker; and a simpler solution is always necessary due to another count-down. Mathematical problems are given a limit to the number of times you can interact with the given number in a scene or chapter that, like QT timers, lead to game over screens if you aren’t clever enough. This end number is clearly marked at the top of the screen, and will sometimes interact with your proposed solution, depending on how quickly, or slowly, you arrive to your solution. Take too long and the answer may change, adding to the difficulty/stress. Thankfully, math problems aren’t timed, allowing you to think through your equations without worrying about hearing the dreaded “pencils down, students” you may still have nightmares of. Of note, too, is that while many problems have static answers, there is too much randomness elsewhere, which brings us to the problems of Chilie. Too many solutions are randomly generated numbers and too many found integers are also random. Some puzzles will task you with reaching 10000, but the only feasible way of arriving there is by adding 1 over and over again, draining all of your moves before the encounter is over. Other puzzles happen to be mindlessly simple, with one or two interactions to produce the desired result. Many times I would restart a scene over and over just so I would be provided with the proper tools for the problem at hand so that I could have just a chance at progressing, and I’m an adult. If this game truly is made for children to help practice math, it shouldn’t be allowed to give bad formulas with unreasonable expectations of how many turns it will take to complete. I understand the appeal of randomness or procedurally generated content, but a math game with complex equations should be properly planned, perhaps with an award for finding the simplest formula to arrive at the answer, rather than a punishment for not knowing that your given puzzle elements are unsuited for your current equation. Besides the problem with Chilie’s problems (get it? ), there’s also the issue with sounds and voice-overs. From what I can understand, Chilie’s background music consists of four songs, two of which are used constantly. The songs themselves begin innocently enough, with lively tunes that match the spirit and playfulness of the titular young girl, but this really becomes a nuisance when you’re staring at the same equation, hearing the same bass line over and over again, with the same fill marking the end of the same 20 second song loop you’ve heard for the past hour and a half. It’s grating and makes the fun of solving math problems (/s) so much less so. Voice-overs, too, seem to have some troubles in their use and recording. Many have an audible hiss that begins and ends with the sound clip, and some sound clips are used repeatedly. While the latter isn’t uncommon among game in general, I do find it to be in poor taste when it’s done so often it’s blatantly obvious. Chilie’s voice is another potential cause for concern. Her voice is quite clearly an adult’s voice sped up to be given a higher pitch. While I did find it annoying and off-putting at first, it eventually became the least of my grievances. So what does this all mean? It means that Chilie, while well meaning, is not the educational title I would want to play, nor the title that I would subject any children to, unless they needed a punishing way to practice arithmetic. The story is goofy and enjoyable for a young one, but the gameplay in between is far too frustrating and uncontrolled to provide any semblance of a meaningful challenge such a title should offer. Perhaps a future update will help set matters straight, but until then, we can always look forward to whatever Beckoning Cat releases next.